busymommylist: Veri Is So Very Tasty And A Giveaway For You! One thing you won't usually find in my house, is soda. I'm not a big soda drinker and I try to keep it from my kids as much as possible. We do have a lot of family gatherings, picnics, birthday parties, even PPV boxing parties. So, you might find a 12 pack or a case of regular soda for guests and our son will have a couple and be ecstatically happy because, he loves soda. Another reason we won't have soda in our house so often.... he will drink it all if it's here! Deegan can't understand why his big brother is acting so ecstatically happy right now! But, Aaron read his fortune and said it reads, "You will be able to drink more soda now." Lol! 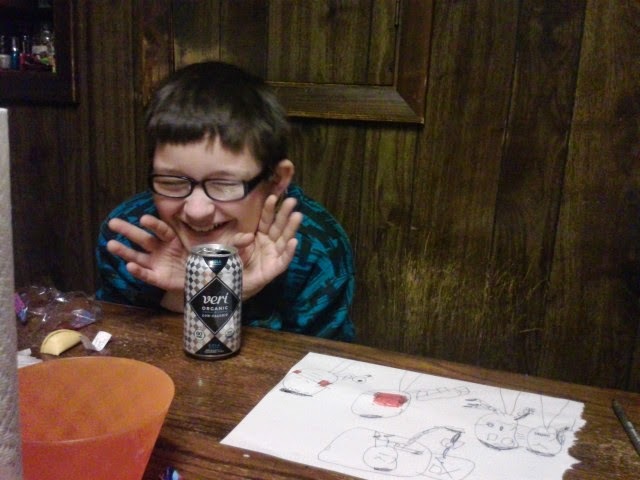 Here is our oldest son, going crazy because he is allowed to have soda lol! We are fortunate enough to have sleepovers, craft parties, all kinds of fun kid parties and our 2 middle children just love having friends over! Of course, when there are a bunch of kids running through the house, they have to eat and drink something, right? I usually try to go all out and do a theme for each sleepover and have a snack buffet or a DIY pizza and salad party, whatever the kids think of, we try to make it possible. I am an organic/all natural mom for the most part, there are exceptions at times but we are keen on organic, healthy snacks and goodies. I have found over the years that almost every guest we have over is totally floored by how delicious and scrumptious all natural can be and I am always asked, "Where did you find this?". 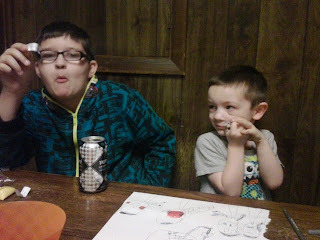 The organic soda was a huge hit and something needed because, I really don't like having to keep things from my kids that I know they enjoy and do deserve. I am just not satisfied with what is in regular or diet mainstream sodas. I understand that water, juice and smoothies can get to be boring and it is nice to have a treat once in awhile. Which is why I was so happy to be able to allow my kids the opportunity to try Veri Soda and we can keep this in the house more often then regular sodas that I have to ration and feel guilty for denying my kids, in a way. Veri Soda has only good ingredients, it's also organic and non GMO and only 60 calories per serving! I don't think we even have a specific favorite, although, I believe Lemon Lime went first! Orange is quite scrumptious! Veri also has cola and ginger ale. We happen to love them all!